Perhaps Google should consider building a BS detector into Glass so it can easily filter entries in future competitions thereby helping it to avoid a repeat of the current mess it finds itself in. 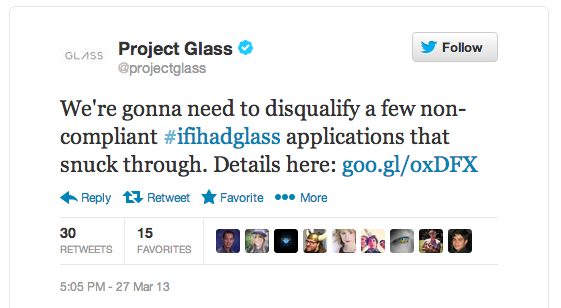 You see, on Tuesday the company started notifying winners of its recent Glass Explorer contest. The prize, Google’s high-tech specs, will be presented to winners once they hand over $1500. 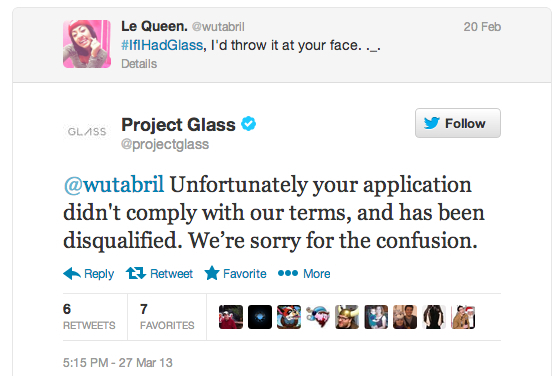 To have a chance of getting their hands on the futuristic eyewear, entrants had to come up with a neat idea about what they’d like to do with Glass and then post it on the #ifihadglass Twitter page. While most people who entered the competition obviously gave some serious thought to their suggestions, some of them were just plain daft. And some of the daft entries won. However, after realizing its error, the Mountain View company is now actually reading the entries and withdrawing invitations from those it deems a bit silly. However, after receiving a message from Google inviting her to hand over a large sum of money for the device, she was sent a follow-up message from the company saying that, after all, she hadn’t won. “Unfortunately your application didn’t comply with our terms, and has been disqualified. We’re sorry for the confusion,” the message said. The mess means some entrants will be left feeling disappointed, though at least it’ll open the door to a few more senders of ‘serious’ entries, giving them a chance to try out Glass and hopefully offer the Web giant some useful feedback about the much-anticipated device before it goes on sale at the end of this year, or possibly early next.